This view from NASA's Curiosity Mars Rover shows the downwind side of "Namib Dune," which stands about 13 feet (4 meters) high. 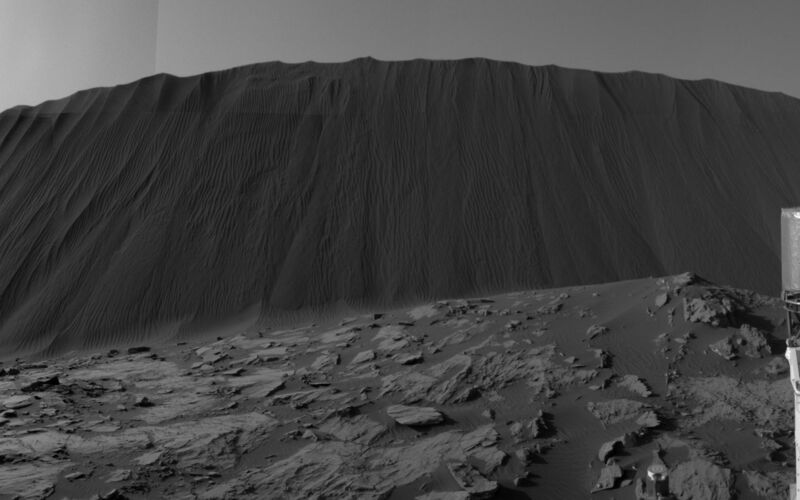 The site is part of Bagnold Dunes, a band of dark sand dunes along the northwestern flank of Mars' Mount Sharp. The component images stitched together into this scene were taken with Curiosity's Navigation Camera (Navcam) on Dec. 17, 2015, during the 1,196th Martian day, or sol, of the rover's work on Mars. In late 2015 and early 2016, Curiosity is conducting the first up-close studies ever made of active sand dunes anywhere but on Earth. 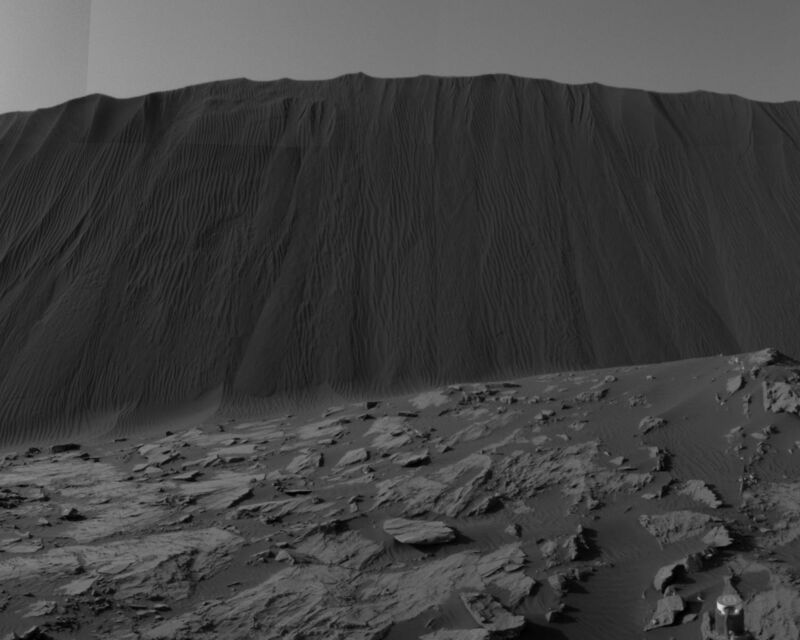 Under the influence of Martian wind, the Bagnold Dunes are migrating up to about one yard or meter per Earth year. The view spans from westward on the left to east-southeastward on the right. It is presented as a cylindrical perspective projection. The downwind, or lee, side of the dunes displays textures quite different from those seen on other surfaces of the dunes. 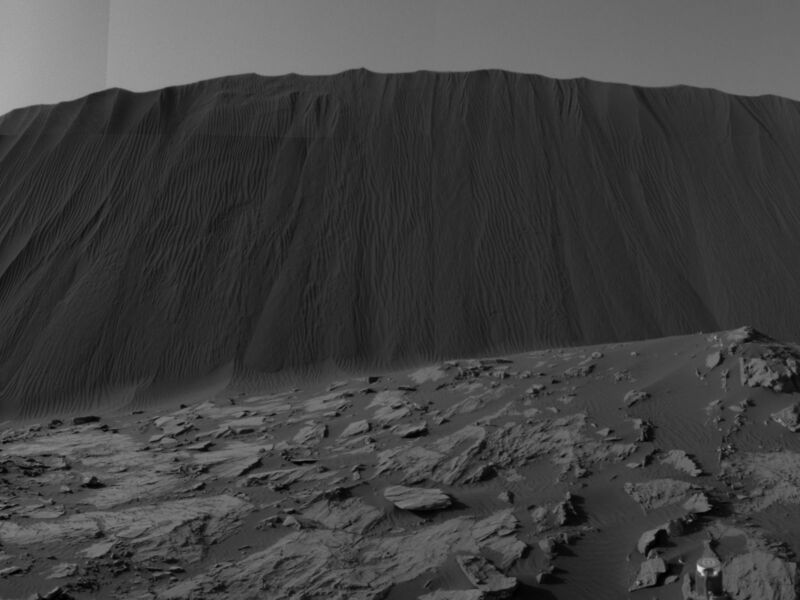 Compare this scene, for example, to a windward surface of nearby "High Dune" (see PIA20168) from three weeks earlier. As on Earth, the downwind side of a sand dune has a steep slope called a slip face. Sand grains blowing across the windward side of a dune become sheltered from the wind by the dune itself. The sand falls out of the air and builds up on the lee slope until it becomes steepened and flows in mini-avalanches down the face. Horn: where sand is escaping from the dune's lee slope and moving downwind. The ripples overlying the bedrock indicate the escape of the sand. Toe: the downwind extent of the dune. Brink: the transition from the windward (stoss) side of the dune to the downwind (lee) side. The brink is marked by a change in slope from the shallow slopes of the dune crest to the steep slopes of the lee side. Grain Fall: smooth areas that indicate grains bouncing over the brink and coming to rest. Ripples: small ripples that form as sand bounces sideways across the face of the lee slope. Ripples have formed over earlier grain flows that likely occurred when winds were stronger and blowing more directly over the brink of the dune. Grain Flow: tongue-shaped feature caused by sand avalanching down the lee slope of the dune. When sand builds up near the brink of the dune and becomes overly steepened, it flows down the slope. The source area of this flow is also noted. Grain flows are the primary way the dune moves forward over time. Ripples have not yet formed on this surface, suggesting that the flow is recent. NASA's Jet Propulsion Laboratory, a division of the California Institute of Technology, Pasadena, manages the Mars Science Laboratory Project for NASA's Science Mission Directorate, Washington. JPL designed and built the project's Curiosity rover and its Navcam. For more information about Curiosity, visit http://www.nasa.gov/msl and http://mars.jpl.nasa.gov/msl/.